A European robotic lunar lander has been shelved during a budget-setting meeting of senior government ministers which began Tuesday, according to German space officials who said the project will be set aside in favor of launcher development, Earth observation, space station operations, and the joint ExoMars mission with Russia. The moon lander was a top priority for Germany, which hoped to secure funding from other European Space Agency member states during a two-day conference of top government ministers in Naples, Italy. "The problem with lunar lander is that we have not found enough money to do it," said Johann-Dietrich Woerner, chairman of the executive board of DLR, the German Aerospace Center. "We found enough countries, but not enough money. There are several smaller countries very much interested, but the big countries did not find enough money." Germany was proposing an investment of 100 million euros, or about $128 million, to finish the design of the lunar lander, which was due to launch in 2018. "We are very upset about that because lunar lander was a project which we tried to support and tried to convince other member states to support," Woerner told Spaceflight Now on the eve of the Ministerial Council, in which representatives of ESA's 20 member states set spending for the next few years. "Unfortunately, the other big member states like Italy and France have other priorities," Woerner said, referring to Italy's focus on the joint European-Russian ExoMars project and France's desire to fund development of a next-generation European launcher - tentatively named Ariane 6. 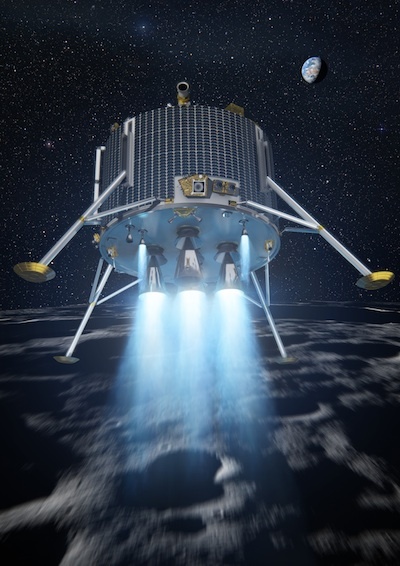 EADS Astrium developed the design and presented a cost estimate for the lunar lander mission in October. The contractor confirmed the total cost of the lunar mission at about 500 million euros, or about $640 million, including technology validation work. The development, construction, testing, launch, and operations of the spacecraft would cost between 300 million and 350 million euros, the study concluded. Spain was Germany's largest partner on the lunar lander, but the indebted country is not able to boost its spending on the mission. Woerner said Germany would not abandon the project yet. Although Germany alone cannot afford the mission, German officials could seek partnerships with individual European states or with other space agencies. Germany's next big standalone national space project is the Deutsche Orbital Servicing, or DEOS, mission scheduled for launch in 2016. The DEOS mission will demonstrate in-space robotic satellite servicing techniques, including refueling and debris removal. The lunar lander was designed to reach the moon's south pole in 2019, using autonomous optical and laser-based guidance systems to find a safe, level landing zone free of boulders for a six-month surface mission. The lander's main goal was to demonstrate Europe's ability to land a robot safely on the moon and evaluate conditions for future human exploration, including the search for resources like water, which could be used by astronauts.